Like many children, I grew up reading the "Little House" books by Laura Ingalls Wilder. I read them often - they are lifelong favorites. When I read them to my girls for the first time, I still cried when they thought Jack was dead, even though I knew better. I love reading about Laura's adventures throughout her life, and I love sharing them with my children. Now, I have actually heard of people who don't like these books, but I'm pretty sure there is something wrong with them. There was also a television show that ran from 1974 until 1983, and if you're around my age, you grew up watching it - at least the reruns. In my mind, Laura Ingalls Wilder will always look like Melissa Gilbert. 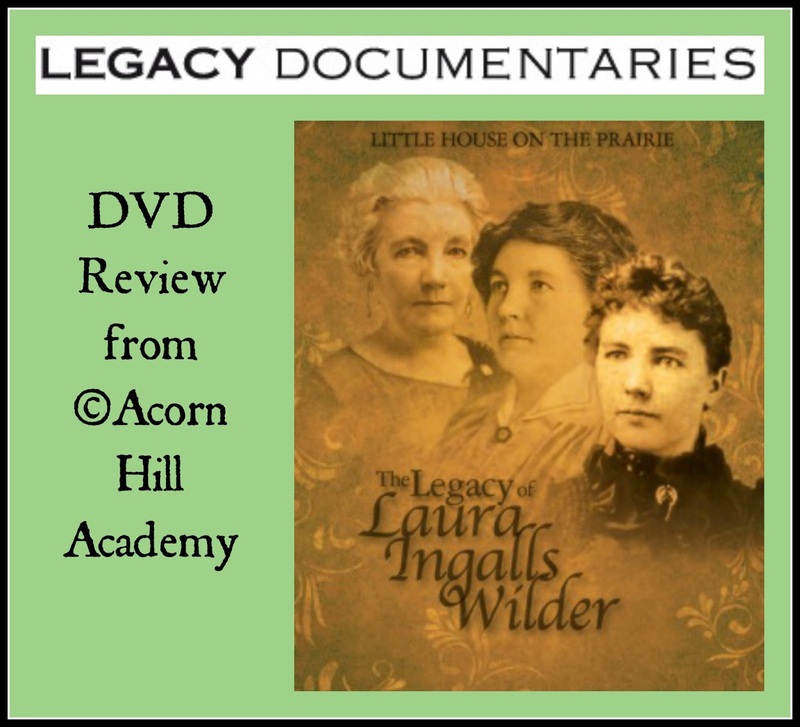 Needless to say, I jumped at the chance to review the Little House on the Prairie: The Life of Laura Ingalls Wilder DVD from Dean Butler with Legacy Documentaries. Actually, it was really hard to choose between this one and the one on Almanzo Wilder, and I would have been equally happy with either one. The documentary itself runs for around 75 minutes. 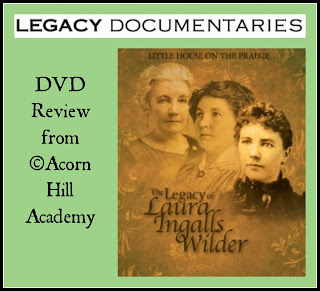 The DVD also includes a "making of" video, as well as trailers for "Pa's Fiddle" and "Almanzo Wilder: Life Before Laura." The really cool thing about this documentary is that it really starts after the ending of Laura's books, and is about her life as a writer. For 13 years, she wrote a newspaper column called "As A Farm Woman Thinks" for a local paper, and wrote poems in a little column called "Tuck Me In Tales." (The poems have been published in a book called Laura Ingalls Wilder's Fairy Poems; you can find it inexpensively used on Amazon. You're welcome.) She used her writing to help support Rocky Ridge Farm - the place where she and Almanzo started over after the hardships of their early years of marriage. It wasn't easy to get her books published. She was writing during the Great Depression, and it was difficult to sell any writing. However, she finally found a publisher in Harper & Brothers who knew children growing up in the Depression would be inspired by the courage, optimism and strength Laura described in herself and her family. Thank God for that publisher's insight! The books are still inspiring children (and adults) generations later. Rose Wilder Lane sounded like a bit of a stinker. She was divorced, which had to have been a huge deal back then. 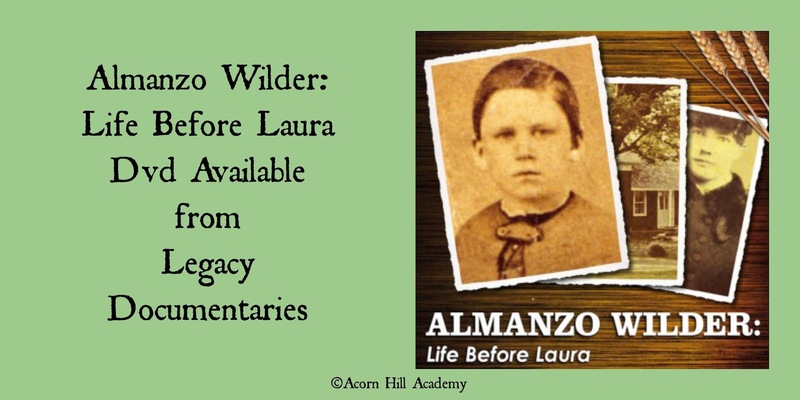 She moved back to live near Laura and Almanzo, and that's when most of Laura's books were published. It was interesting to read about things Rose thought should be changed or left out of the books. For example, when they got to Little Town on the Prairie, Rose wanted to change the main character to Laura's younger sister, Carrie, so that the heroine would continue to be a young girl. Laura refused, because she felt her readers were growing up with her character in the books. I can't even imagine not reading through Laura's life, can you? Also, Rose wanted to leave out Mary's blindness because she thought it was too depressing. Laura stated that she could not continue to write the books without that part because it was too significant in their lives. Again, I can't imagine the stories without Mary's story. Think about this: Laura Ingalls Wilder grew up traveling in a covered wagon and lived with no electricity or indoor plumbing - or even glass windows. Before the end of her life she saw trains (took one to see Rose in San Francisco) and even flew on a plane. Her life spanned the most incredible period of American history. When her books were being published, there was no such thing as "Young Adult" literature; that term was coined in the 50's, so Laura was really blazing a trail. The documentary said that when readers would drive by her house, she would welcome them into her home and even give them a tour. Doesn't she sound lovely? All right - I could keep going, but really, you need to get this DVD and watch it for yourself. It's available from the Laura Ingalls Wilder Historic Home & Museum for $24.95. You know you want one! 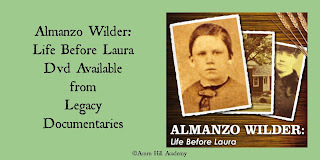 There is also a DVD available about Laura's husband, Almanzo, entitled "Almanzo Wilder: Life Before Laura," available from Legacy Documentaries. I haven't seen it yet, but I am going to get one SOON.